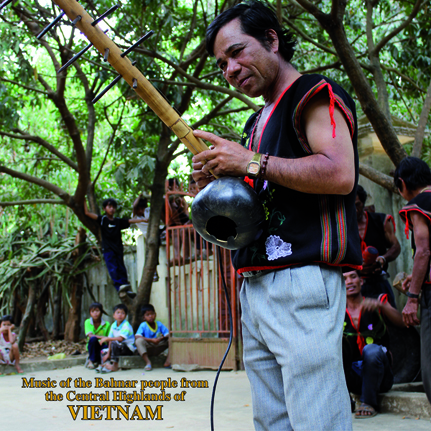 This LP is a collection of music from the Bahnar people who live in the Central Highlands of Vietnam. The Bahnar are famous for their rich musical culture and this is perhaps the first-ever release to introduce the full range of Bahnar musical instruments and styles, including gong ensemble, bamboo zither, bamboo xylophone, bamboo fiddle with mouth resonator, and folk songs. Melodic and hypnotic, this music was selected from recordings made in the Kon Tum province from 2006 to 2015 by Eisuke Yanagisawa. One of many highlights of these recordings is a most unusual and stunning instrument - the bamboo fiddle with mouth resonator – which creates an effect that is on one hand an organic auto-tuner of sorts and on the other Peter Frampton coming alive on his 1970s talkbox. The Bahnar’s music has been passed down through the ages in each village but is now endangered because of cultural assimilation related to changes in their lifestyles and living environment. These recordings preserve for us the vestiges of a traditional music culture that might no longer be heard in the near future. Limited edition vinyl LP pressing with insert of text and images by Eisuke Yanagisawa.